I was very late to the party with Toys That Kill. I pretty much just started listening to them through their last album, Fambly 42. I will say, that was a pretty amazing introduction to the band and I was primed and ready for Sentimental Ward. While I don't think it's quite the earth shattering experience that Fambly was, Sentimental Ward is still a hell of a little record. The thing that really strikes me about Toys That Kill is how much milage they can get out of repeating just a handful of chords. Just like Rocket From The Crypt is able to own the world with repeating the G chord on "Sturdy Wrists," Toys That Kill can craft a supremely catchy and powerful song using only a handful of notes and chord changes. I actually think it speaks to the talent of the band to be able to be so economical, yet still churn out hit after hit. I do feel that 2016 has been a little all over the place with records this year. Don't get me wrong, there's been some pretty tremendous albums so far, but there's also been some let downs. 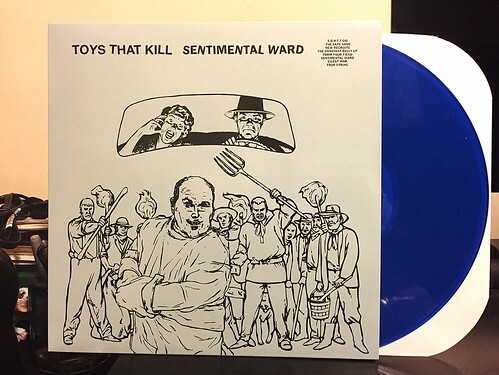 Sentimental Ward is a very strong entry for the year. While I don't anticipate it being a slam dunk top ten or anything, it's an easy top twenty and absolutely worth checking out if you're unfamiliar with the band. The Brokedowns / Direct Hit - Split 7"